November 2017: Served the first request to hide an image for privacy reasons. Go find it. April 2016: Let's encrypt it. 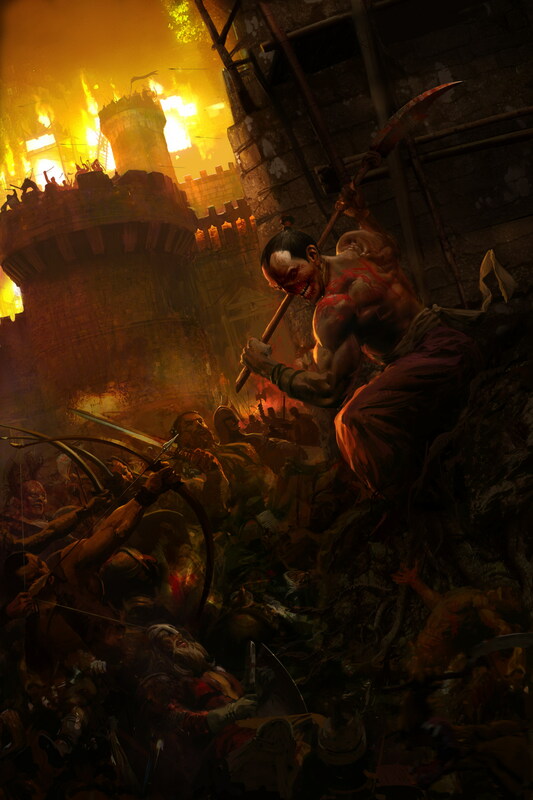 October 2015: Fixed the corrupt JFIF-header of Graig Mullins' Soulblighter full size image. 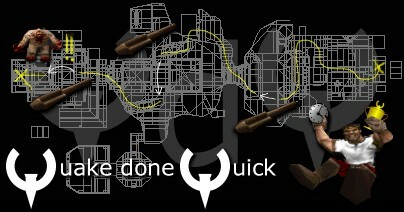 Long before LoLcats conquered this planet and the walrus lost its bukkit there was Quake by id Software. This game like no other inspired many people to create content and art in form of poems, haikus, comics, game mods, short stories or just screenshots with overlayed speech bubbles - just for fun. 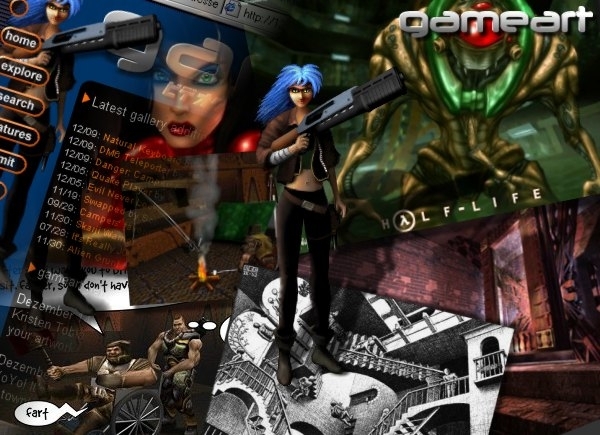 GameArt.com was the one-stop site to collect all this art and news from the net related to game mods, graphics software, tools like model and skin editors as well as other community events and projects. Additionaly, GameArt.com featured web hosting for artists, polls, contests and giveaways, tutorials, spotlight articles on artists and their projects (Web Archive snapshot), software reviews and a job area where people could offer their skills and/or look for needed artists. Some creative heads even found jobs in the gaming industry - like for example Dhabih Eng who is working as a conceptual artist for Valve Software now. Craig Mullins and Mike Krahulik even have their own Wikipedia articles - go figure! Much of this timeline was recovered from memory (which unfortunately went up in smoke from time to time those days...), Stephen Heaslip's Blue's News archive, the Internet Archive Wayback Machine, PlanetQuake's news archives and old backup CDs which were partly corrupted and unreadable. Braindead's CDs were of a higher quality, obviously. Welcome to the digital age! PlanetQuake was not yet owned by IGN those days, Joost Schuur aka lotlhwI and Dave Kosak aka Fargo were our main contacts at PlanetQuake and Blue from Blue's News already seemed to be working 48 hours a day sitting in front of his screen pumping out news. In 1996 there was Braindead's Art Site hosted by the famous PlanetQuake Network at www.planetquake.com/braindead/ collecting news from Quake mods, related tools and graphics software and an artwork gallery hosting over 800 pictures as of September 21, 1998. Nop from CO2, the "Clan Of 2"
Nop released his Quake Comic Death at DM5 in the tradition of other comics like Dank and Scud by Michael Houston (mirror) and The Adventures of Axeboy on December 18, 1997. Death at DM5 can be viewed here. 3, a very talented artist and third member of CO2 left CO2 on May 26, 1998 after a short but very creative period (PlanetQuake news post). On June 19, 1998 CO2 finally closed its doors to concentrate their energy on "an upcoming site" (PlanetQuake news post). Tek, the "other half" of CO2 is still into AI, machines and Robocup today. 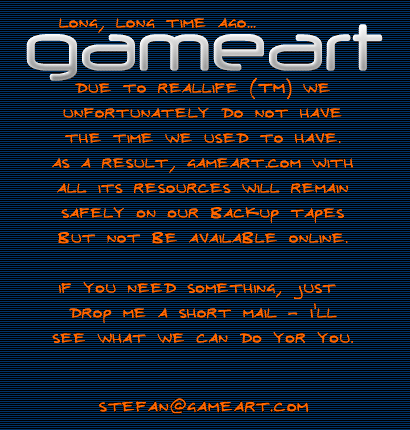 In the middle of 1998 Braindead and Nop who knew each other for some time, prepeared to merge their sites into a comprehensive collection and one-stop source for all things related to computer game fan art. nop made a lengthy update to the URL formerly known as CO2, basically giving a status update of the latest project he and Braindead have been working on. Sounds like the new site's coming along great... stay tuned! 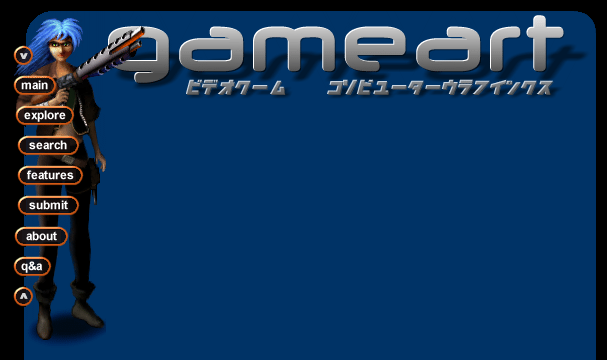 The latest addition to the GameSpy Network is GameArt, a site dedicated to gaming-related artwork. The site is brought to you by Nop and Braindead, formerly of co2 and Braindead's Art Site, two of the best Quake Art sites around. The site already features hundreds of pieces of gaming art, which you can browse or search, as well as being able to sit back and relax as the site flicks through pictures for you. You can vote for your favourite pieces of art, and bring up a list of other pieces by that artist. If that's not enough for you, there's also related features, news and reviews on gaming art and all the utils you need to create it... Head over there now to take a looksie! From the ashes of CO2, rises GameArt! Braindead and Nop showcase the very best in fan created game-based art. Browse the vast collection, and maybe submit some of your own! Maybe there's a little Da Vinci in ya! GameArt.com site concept by Braindead and Nop - notice the early version gun. 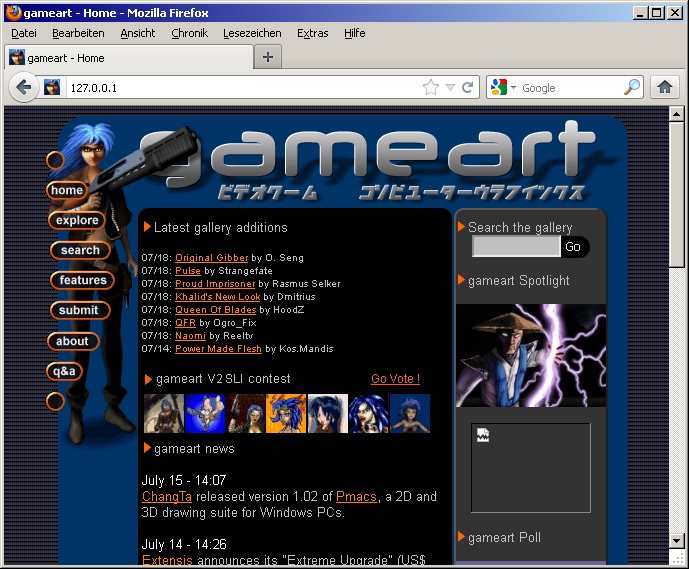 GameArt.com running in a Windows 2000 VM (original size for 800x600px displays). Backups, baby! Braindead then moved away from Germany while Nop still enjoys going 140mph+ on the autobahn and posting random things about his hardware fetish at onderka.com. The domain gameart.com itself was sold to NCsoft around 2007. 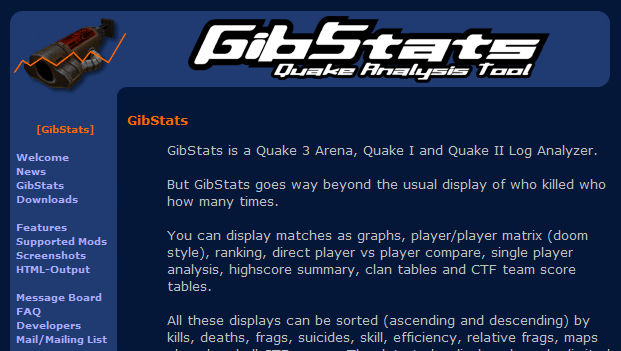 For more boring details and chronologically correct stuff simply head over to the PlanetQuake news archive and do a search on co2, braindead or gameart. The Internet Archive Wayback Machine also has some partly working snapshots of the site. The original Access mdb database of GameArt.com running on Windows NT 4.0/IIS was dumped to XML files on a Windows 2000 Server VM in VirtualBox, imported into MySQL and mixed with some PHP magic. This server now is a dedicated dual quad core Xeon with 24GB of RAM and 1TB disk space owned by Nop. All images (latest is 1292 as of August 28, 2002), weighing in at about 50MB, are available with complete data (i.e. Submitter, URL, tags, votes) - most of them also in a higher resolution. See the diagnostics page for a detailed overview on currently available images, zip files and image meta data. If you can spot yourself here, if you find one of your long lost creations or if you just want to say "hello again", just drop me a line at gameart@onderka.com. This is for you, 3, Tek and all other artists out there. Some links. We know you expect them here! This site is a tribute to GameArt.com by Braindead and Nop, the first and only of its kind page for fan contributed computer game art - mostly Quake 1/2/3 related. 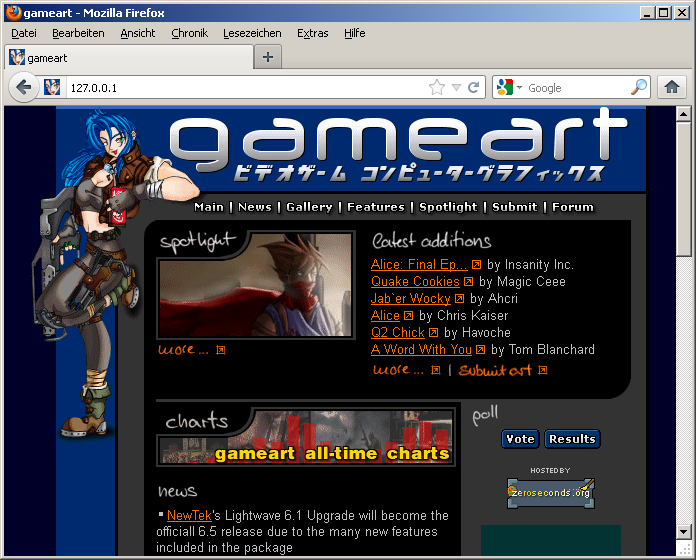 What you can see here is the content of GameArt.com when it was closed in 2003. © 1996 – 2019 Nop (Stefan Onderka) and Braindead (Martin Brunken). All rights reserved. All artworks © their respective artists. All brands and (brand) names © their respective owners. This is a private, non-profit tribute website. This site is not affiliated with IGN, id Software, NCsoft or any other website. More information.